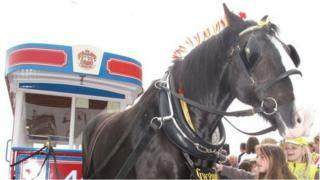 The Isle of Man horse tram service is to be terminated after 140 years, Douglas council has confirmed. A spokesman for Douglas Borough Council said the service, which has been in existence since 1876, was "no longer financially viable". The council said the decision had been taken "with very great regret" at a special meeting in Douglas on Thursday. Last year the service, which runs along Loch Promenade, finished in September and ran at a loss of £263,000. The decision follows a proposal by the council to amalgamate the Tramway Terrace stables site with the tramway hub at the Strathallan site at an estimated cost of £2.9m. The proposal had been to finance the scheme with a 30-year loan, which would have cost the council £4.8m over its life. Last month it was decided that this scheme was "not financially viable". Council leader David Christian said while recognising its "long and illustrious history", continuing the operation would place an "unacceptable burden on the ratepayer for the foreseeable future". According to the council the tram's horses will be "relocated to good homes" and the rolling stock will be offered to transport museums. Both the Tramway Terrace, stable site and Strathallan will be sold. The Douglas Bay Horse Tramway, which was built and originally operated by Thomas Lightfoot from Sheffield, runs along Douglas promenade for 1.6 miles (2.6 km) from the Strathallan terminal to the Sea Terminal. The service is one of the oldest horse-drawn tram services in the world. Councillor John Skinner thanked the tramway staff for their hard work and long-standing commitment to the service.